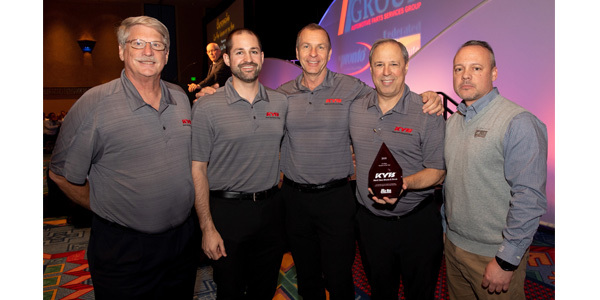 Members of The Group chose KYB as Co-Man Vendor of the Year. From left to right are: Kim Tingley, KYB; Rayn Dickerman, KYB; Paul Kratzer, KYB; Mike Fiorito, KYB; and Chris Murphy, Federated Auto Parts. TheAutomotive Parts Services Group (The Group) honored two supplier partners at its recent national meeting. 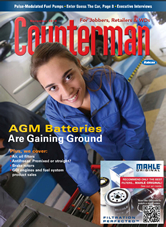 The Group members chose KYB as the Co-Man Vendor of the Year and Autolite as Co-Man Vendor of the Year for Order Fill. Presented annually, The Group Co-Man vendor awards honor supplier partners that have shown outstanding dedication and support of The Group Co-Man operation and programs. The Co-Man enterprise began with members deciding to open a jointly owned warehouse. The operation has seen significant growth each year since its inception, expanding numerous times to meet the rapidly growing demand of members.